At an early age, my parents and grandparents introduced me to the beauty of the world instilling in me a desire to travel the globe, exploring the beauty of nature and immersing in other cultures. 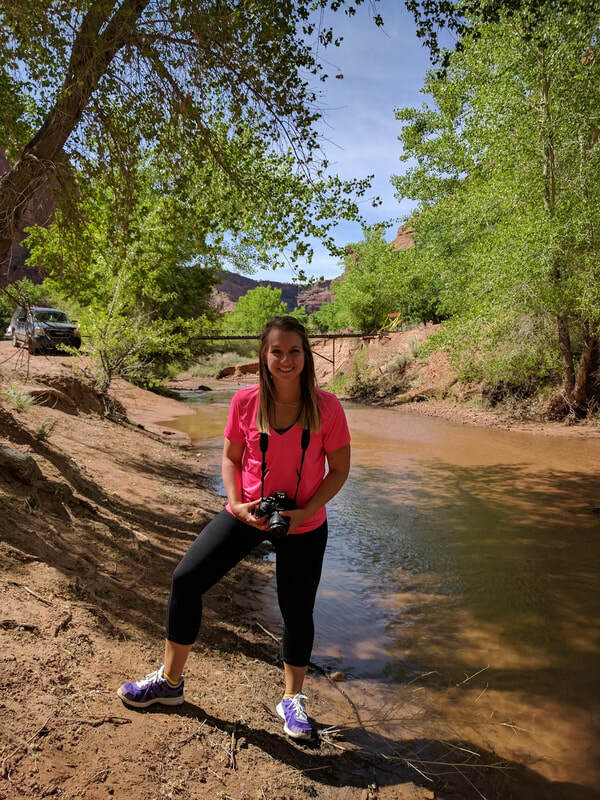 One area of the United States I had not yet visited was the Southwest, so they decided to take me on an adventure while my husband was away on military deployment. 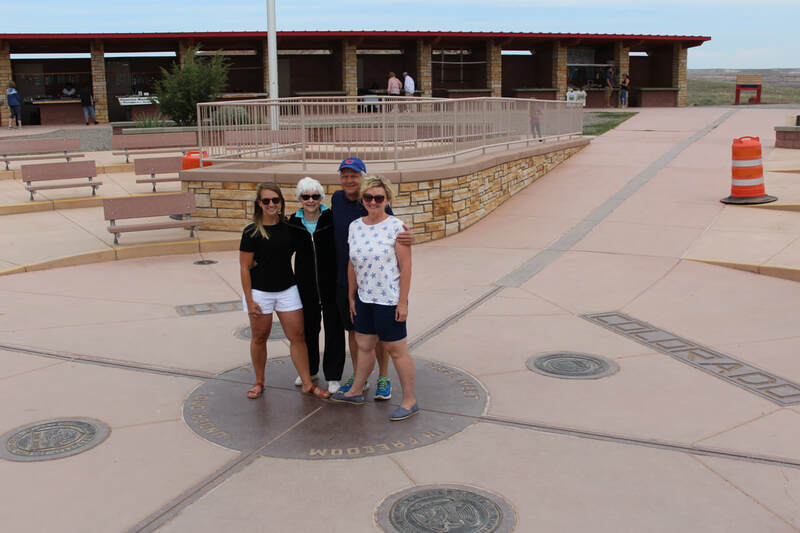 While it wasn’t exactly a Route 66 trip, we were crisscrossing the famed roadway most of our trip. 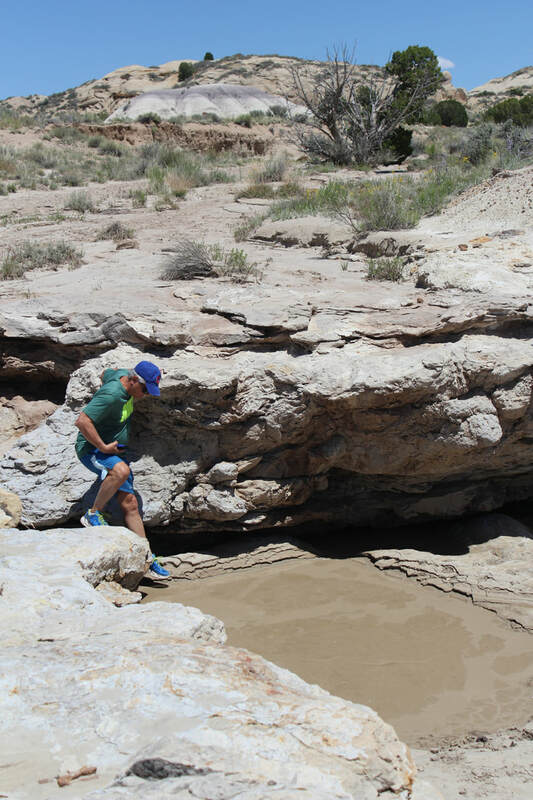 Our goal on Day 1 was to reach Gallup, New Mexico. I had no idea my mom and grandmother had “must see” stops along the way. 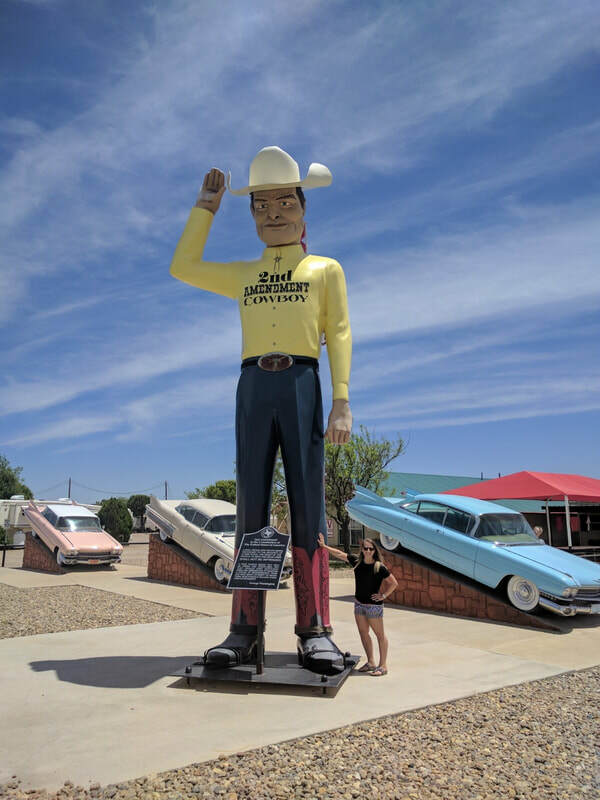 In Amarillo, we stopped at the Big Texan, famed for it’s 72 oz FREE steak dinner if eaten by one person in 60 minutes. The property had areas for tourists to stretch our legs including a shooting range (think Disney and ghosts) and some old-timey ring-toss games. My dad and I competed and we laughed plenty. The trip was off to a good start. 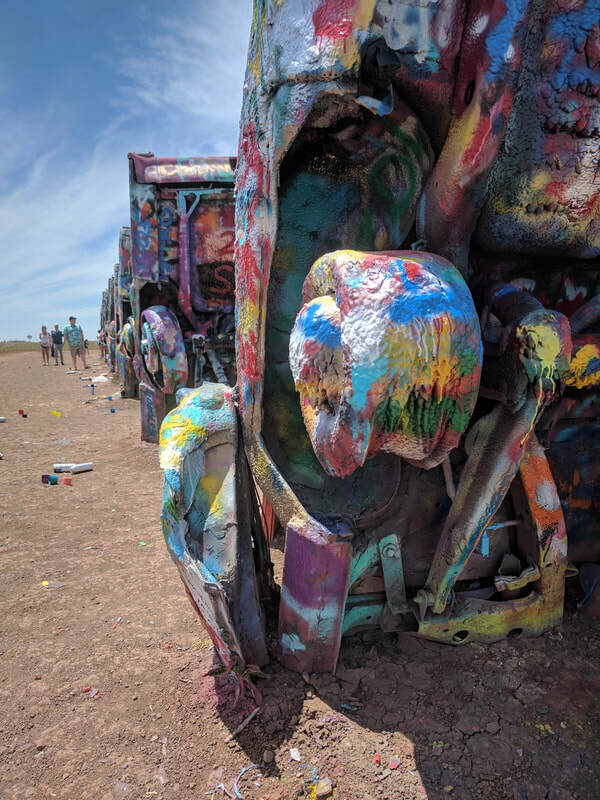 Our next stop before leaving Amarillo was the Cadillac Ranch. My grandmother wanted to see this place again. Since her last visit, the cars had been moved a little to make room for progress. They were now no longer in their original condition but rather graffiti-painted by visitors. We found a few cans in the pile and did our own art work as well. I spray painted “J <3 A” to celebrate my 4-year wedding anniversary even though my sweetie Adam was a half-world away in Ukraine. 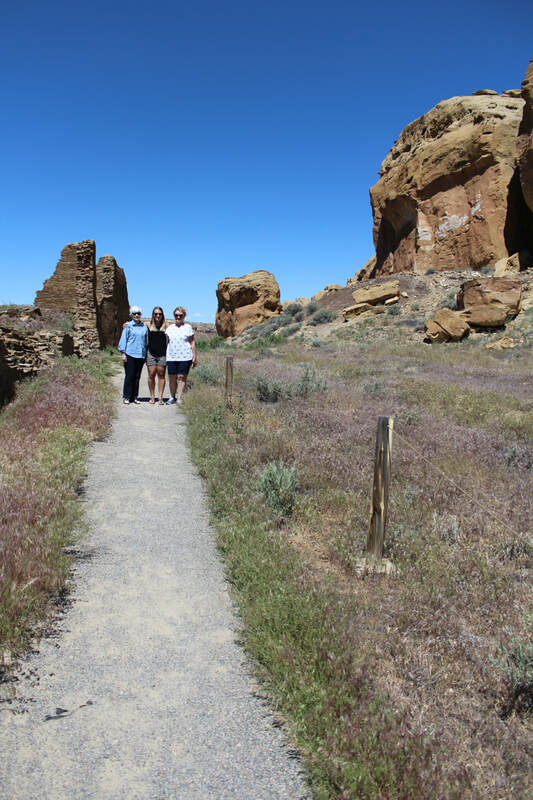 On day two we explored the Native American ruins in Chaco Canyon. We’d been warned about the difficult road to get there and it was definitely better suited to 4-wheel drives. We then found Bisti Wilderness so that Mom could spot more hoodoos. Sidebar: Hoodoos are naturally occurring columns or pinnacles of rock often with larger pieces balanced on thinner bases. Bisti – which in Navajo means “a large area of shale hills” – is a 45,000 acres region of dry washes. We ventured a little further than we intended and could easily have become one of those Nat Geo stories of stranded tourists. But we encountered honest-to-goodness quicksand! And we saw lots of hoodoos and a rock like a ninja turtle. After a good seven-mile hike and sunburn, we made it back to our rental and were on our way. 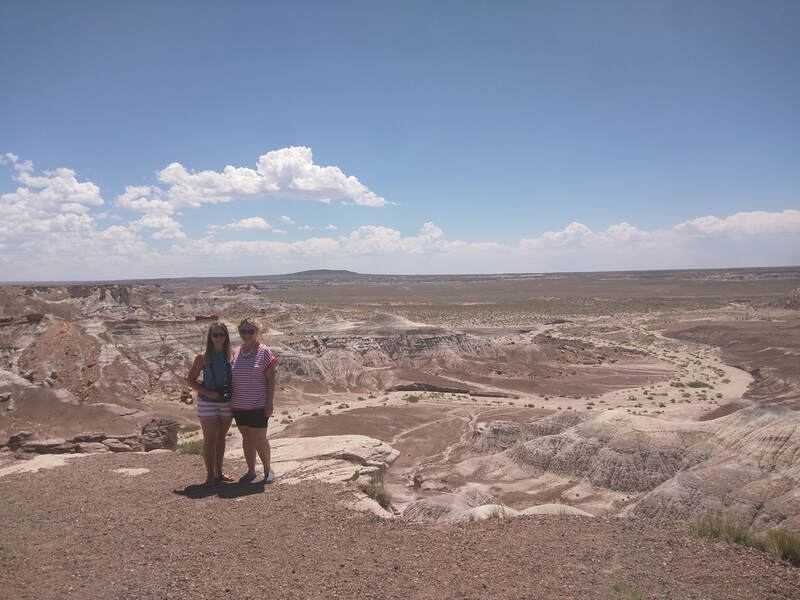 On day three we visited the Petrified Forest and the Painted Desert in Arizona where I channeled my inner child, excited each time I saw a lizard while filling up my camera’s memory of the former forest’s beauty. 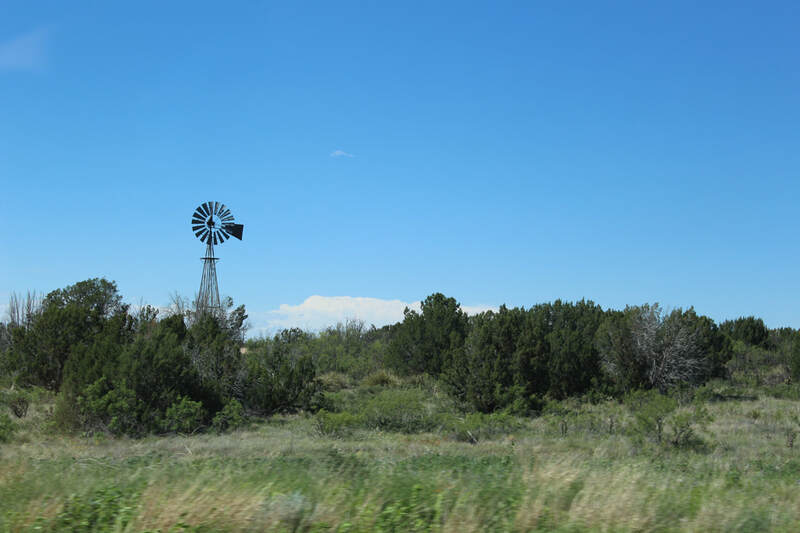 The national park is perfect for car trips as we meandered along the route, taking pictures as we wanted, reading the signage, and hiking along trails. We had ice cream at the Painted Desert Inn which doubles as a small museum. Styled in Pueblo Revival, the Inn originally opened in 1920 but was purchased by the National Park Service in 1935. FDR’s CCC renovated the property which is a prime spot for a rest out of the glaring sun while viewing the great expanse of beauty created by stacked clay and sandstone. We spent a full day in this colorful place before heading north to Chinle. 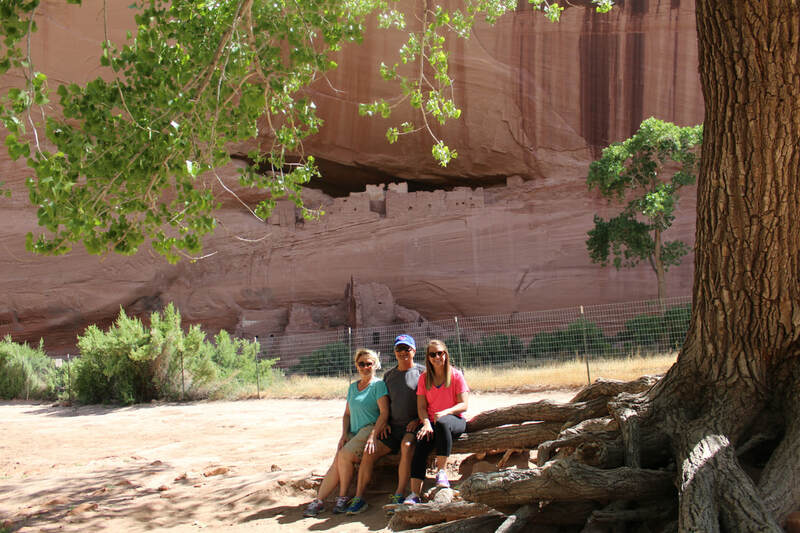 Our guide for the jeep tour of Canyon de Chelly National Monument was a Navajo man who was regarded as a local legend. His grandfather was a Navajo Code Talker and he was well versed in the oral tradition of Navajo storytelling. He showed us cave dwellings, pictographs and petroglyphs, explained how the CCC planted trees to help stop erosion without realizing the invasive species (Russian olive and cottonwood) would choke out natural trees and brush. 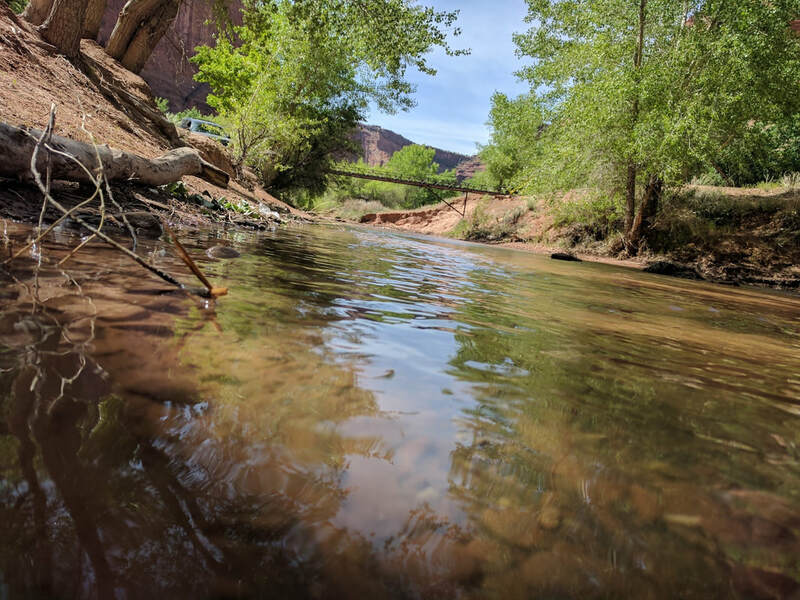 Our jeeps whirled along the red clay roads and clung to the cliff walls in the shade of the protective cliff overhangs, splashing across the creeks that we encountered. Grandma had never been four-wheeling so was pleased to have another item crossed off her bucket list. 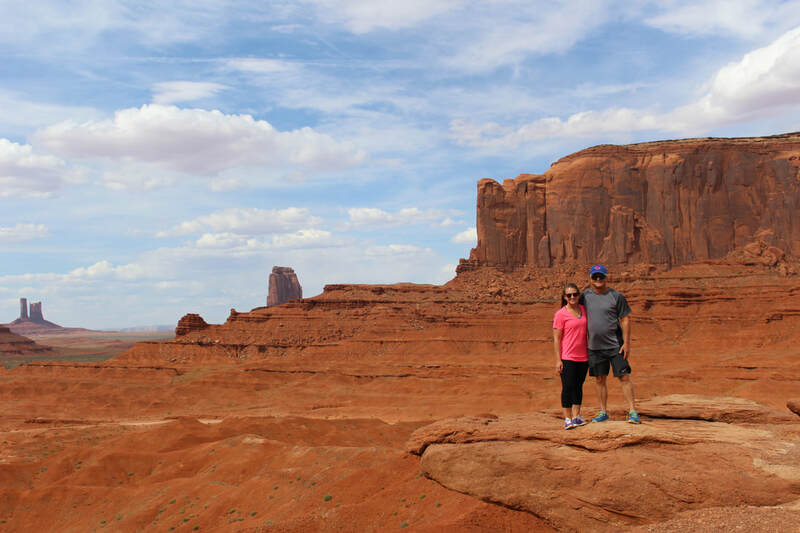 On the recommendation of one of the jeep drivers, we spent the afternoon with a visit to Monument Valley on the Navajo reservation in Utah. I kept thinking “this is spectacular” only to turn another corner and say it again. Dad was glad we had a rental given the rough terrain though we never grew tired of the bouncing we endured on the trails. We returned to Chinle for the night and enjoyed tacos made with Navajo frybread and some blue corn pancakes. Most frequent sightings on the drive were dogs, wild horses, yurts, and homesteads of incredibly poor people. 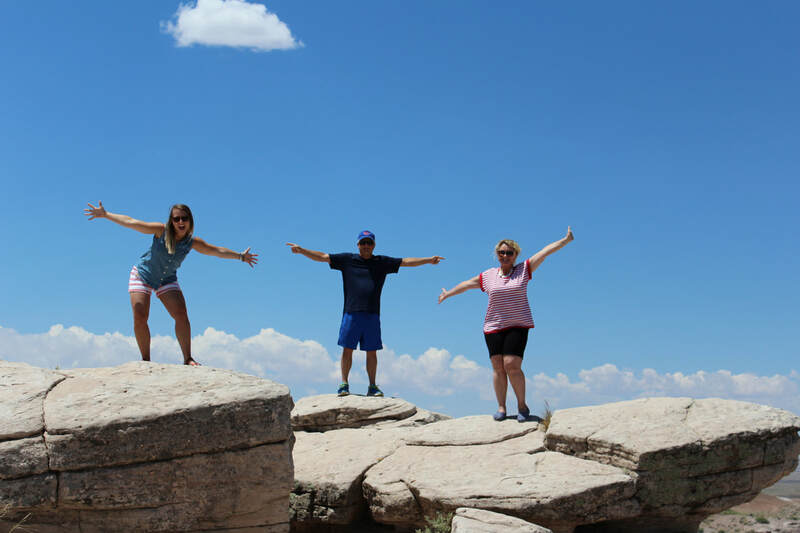 Up early the next morning, we set out for Four Corners – the spot on the Navajo reservation where the four states of Utah, New Mexico, Arizona, and Colorado come together. 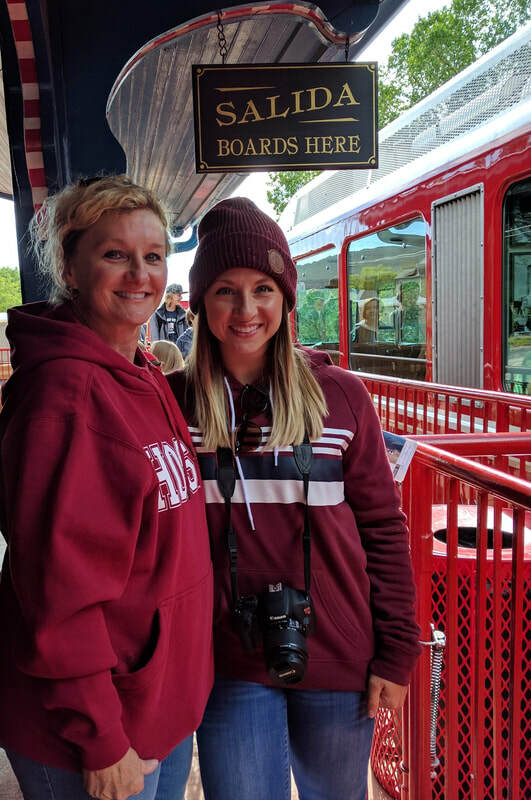 The visit was not worth the hype, but mom was able to check it off her list. Essentially the site is in the middle of a pasture with plenty vendors manned booths forming a square. In the center is a bronze and concrete plaque commemorating the great spot on earth. We waited our turn for the photo op and headed to Mesa Verde, Colorado. ​Mesa Verde, unlike Four Corners, was another mind boggling experience. We knew we wanted to tour a cliff dwelling so visited the Tourist Center for our tickets. 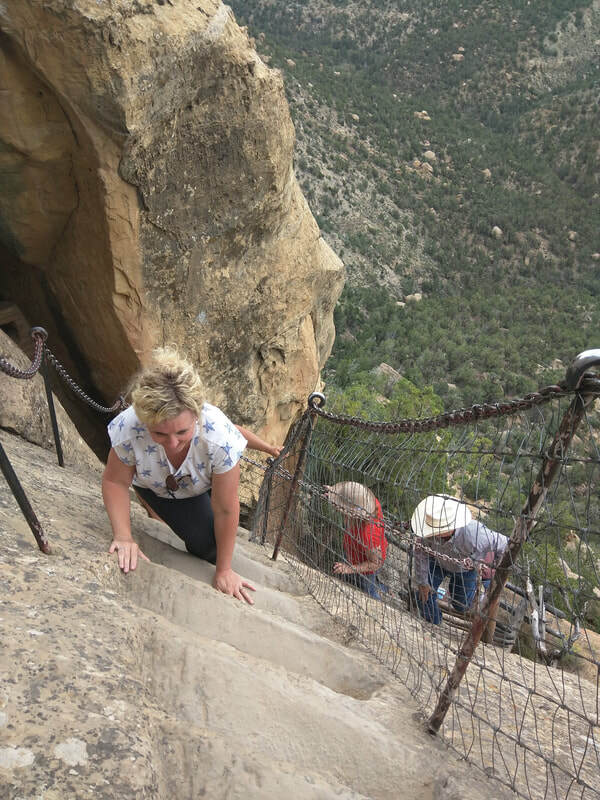 Mom and Grandma were a little apprehensive after hearing all the warnings – climb 60 feet of ladders, crawl through some narrow passages, etc. 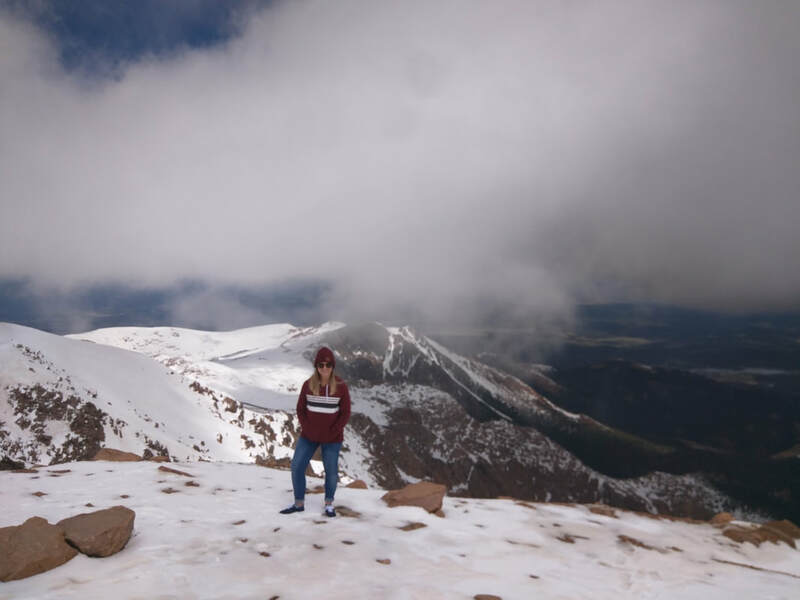 But they were good sports, purchased tickets, and off we went to the summit. I have to admit, I was a little nervous when I saw the location and the ladders. The tour was incredible. We were literally walking among the rooms of the dwellings! Soot still stained the cliff ceiling from fires long since extinguished. I was fascinated by the short wall along the edge and then saddened as well when I learned it was to keep children from wandering away from parents and falling to the valley below. I closed my eyes a few times trying to imagine the people who had lived there, their lives, their struggles. The final climb up was a doozy – nearly straight up! Exhilarated and tired, we spent the night in Durango. Day six was a travel day taking us from Durango to Manitou Springs. The landscape was majestic with mountain peaks and greenery – quite a contrast from equally beautiful sage and dessert. We strolled the old downtown area of Colorado Springs until a light rain began. We hurried back to the hotel just in time for Grandma to see the season finale of The Amazing Race. We enjoyed the episode and talked about the antics of our many trips to the same locations featured on the show. 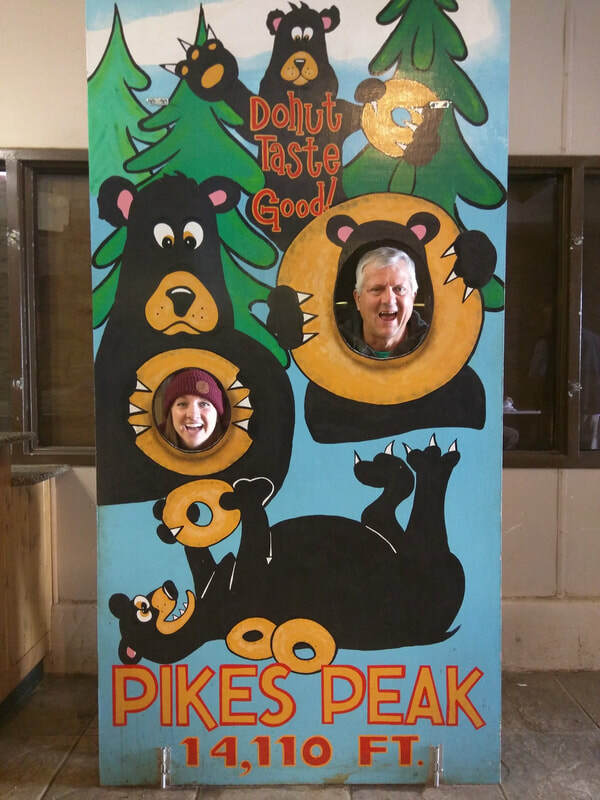 Early on day seven, we arrived at the Pike’s Peak location and took the cog train to the top. Grandma had been to the Peak many years ago and wanted to do it one more time. The ride was smooth and cool with a heady fragrance of pine, spruce and fir. And marmots! Such animated little creatures!! There was plenty of snow on the summit with wind-swept drifts higher than we were tall. The altitude quickly caught up with us. Sidebar: If mother nature calls, get to the restroom line (far right corner upon entering the building) as soon as you arrive to avoid going back down with a full bladder. 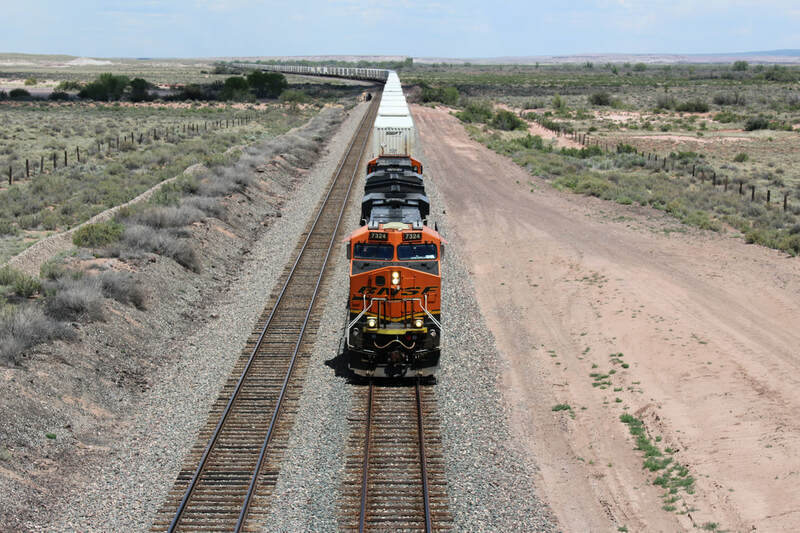 Another tip: Don’t ignore the blast of the train whistle signaling last call to board! It wasn’t a clear day so our view wasn’t as far as advertised, but it was still expansive. We tossed a few snowballs for fun and grabbed a burger. As instructed, when the horn blasted, we reported to our train car with a light snow beginning to fall. Pay attention to the tour guides to be educated and entertained. They did a marvelous job! When planning trips, most people think of heading to theme parks or foreign capitals or popular beaches. I’m glad my parents wanted to check out a few diamonds right here beneath our noses in the good ole USA. What a terrific time we had! Sidenote: The worst porta-potties I've ever had to use were in Mesa Verde and Monument Valley. By now you know I am no stranger to bathrooms - Be ready to hold your breathe and have your hand sanitizer ready!